I have two great family game reviews to share with you PLUS a giveaway (be sure to scroll all the way to the bottom). We (well the kids and I) love games of any kind. Now I say the kids and I because my hubby does NOT enjoy playing board or card games...however both of the games I am sharing with you today he actually played and admitted to having fun. Reverse Charades is a super fun, hilarious twist on the classic Charades game which has been around since the 18th century. Charades has come a long way and over the years it has been changed often. Well once again it has been transformed and has become Reversed Charades. 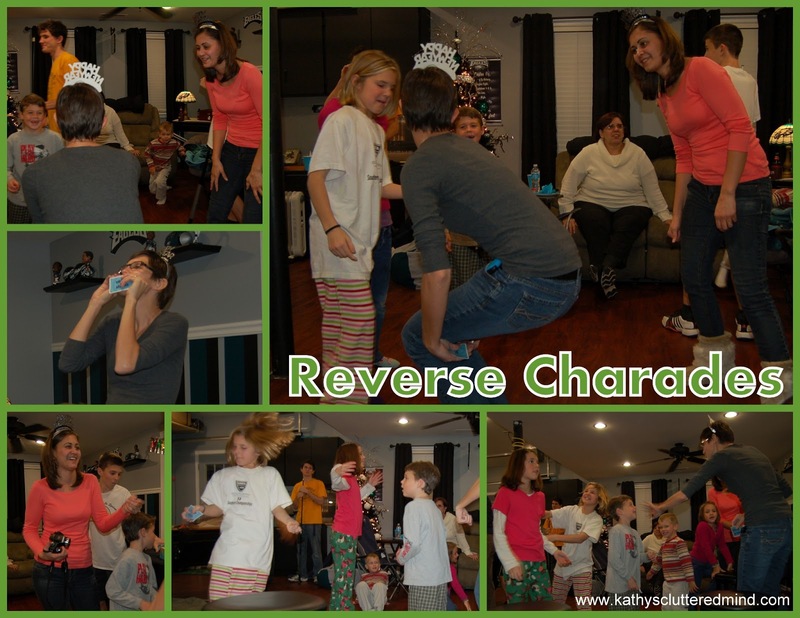 Reverse Charades is a fun, fast paced game perfect for family game night, church groups, homeschool groups, family reunions, girls night out, dinner parties, holiday gatherings....you name it. You will be guaranteed to have a blast playing Reverse Charades!!!! There is a Junior edition, original edition and 3 expansion packs (holiday, sports, girls night out). I asked to review the Junior edition since it is recommended for children ages 6 years old and up. Included in the game box are 720 word cards (in their own grab and go box) and a 60 second sand timer. I love games that have simple instructions. The instructions are so simple in Reverse Charades because there are only 5 and they are printed on a little 4 x 7 1/2 card. Yup no reading long, complicated instructions in this game. 1) Split into teams of 3 or more and decide on a number of rounds or a point target to win. 2) Each team has 60 seconds to guess as many words as possible. 1 word guessed correctly = 1 point. The acting team can pass on a word they don't like (but only one time per round). 3) Each team selects a guesser and the rest of the team acts out the words. The other team holds the actors word cards and and flips the timer. 4) Team members that are acting may not speak among themselves (you loose a point if you do). But you may use objects and/or people in the room. 5) After the 60 seconds is over, tally your points on a scorepad. The 1st team to reach the target wins. We played this fabulous game for the 1st time on New Years Eve. My two kids, their 7 cousins and maybe even a few adults had a blast playing it together. Wanna take a guess at any of our words? As a homeschool mom I am always on the search for games that are not only fun but educational too. So what does Reverse Charades offer your chidren? Well it exercise your child's imagination, assist them with their vocabulary and reading skills and even get their body's moving. This is a perfectly acceptable game to play during your homeschool day. And guess what else? Reverse Charades has won numerous awards. And NOW there is even a FREE app to allow you to play on the go. There are 100 sample cards total with the FREE download. For 99 cents each you can purchase the full card set packs (original, junior, awesome 80's, sports, holiday, girls night). Download the app at the Apple App Store or the Droid Play Store. Reverse Charades is available at over 2,200 stores in the US as well as online and retails for around $23.99. Camp is one of the many fun games produced by Education Outdoors. Education Outdoors creates fun outdoor themed games that are great for the entire family. I was super excited to review Camp because we are an outdoorsy, nature loving family so I knew it would be a perfect game for our family. Camp gets a RAVE review from my husband because it is fun, quick, simple and educational too (shhh don't tell him I wrote this). The game includes 1 game board, 199 game cards (400 questions and 99 fun facts), 1 decoder, 8 game animal characters, 1 die, 16 level cards and 1 compass card. Camp is a game where both children and adults can be challenged with questions and facts. My most favorite thing about Camp is that it is designed to grow with the players. There are level 1 questions which deal mostly with the identification of animals. As a player increases their knowledge about the great outdoors they grow into higher level questions. I also love that the answers require the use of a decoder. It makes it much easier to assist little ones with reading the questions without worrying you will get a glimpse of the answer. Camp is recommended for children ages 4 and up. Camp also has simple, easy to follow instructions that fit on one page. Can you tell I really despise lengthy game instructions? The object of the game is to be the first person to reach it back to the campfire. 1) Choose your characters (there are 8 cute animals to choose from) and card level (level 1-4). Both of my children did level 1 (ages 7 and 5/12) the first time we played. We determined that level 1 was probably too easy for my nature loving children so we bumped them up to level 2 the next time we played. My husband and I answer the level 4 questions. The youngest player always goes first. 2) Roll the over-sized die, move your game piece and follow the instructions on the board. There are white footprint spaces where you do nothing and the dice passes to the next person. There are green footprint spaces where you must answer a camp card question. If answered correctly you get to go again. And there is Camp Clubhouse space that sends you either ahead or back to the Clubhouse where you read a camp fun fact card. 3) There is also a special compass on various camp card questions which allows you to take a short cut back to camp. 4) The game ends when a player arrives back at CAMP! Many of the cards have beautiful animal photos on them which are used to answer many of the level 1 questions. Here is an example of a camp card level 1 question: What bird lives in or near water? a. pheasant b. loon c. grouse. And here is an example of a camp fun fact card: Polar bears can swim 50 miles without pausing for rest. As the company name suggests this is a very educational game. Children will learn all about the great outdoors, animals, nature and more. In May our entire family is going on a camping trip to the beach and I am looking forward to sharing this fun game with my nieces and nephews. 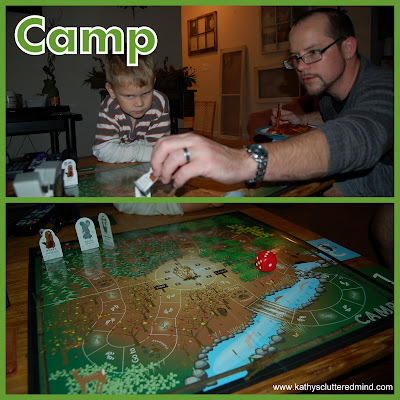 You can purchase Camp or any of the other fabulous board games directly off the Education Outdoors website. Camp retails for $24.99. Reverse Charades has graciously offered to give away a Junior Reverse Charades Edition to one lucky winner. Only the first entry is mandatory. Other entries are optional and give you extra chances. This giveaway is not affiliated with Facebook in any way. The winners will be posted on the blog and will be emailed. Winners must reply within 48 hrs with their contact information or another winner will be chosen. The prize will be mailed directly to winner by Reverse Charades. *Disclaimer - I received a copy of Reverse Charades and Camp in return for my honest review. Please note that prices indicated in the post are subject to change. I was not compensated for my review and all opinions are our own! Many of the links found on my side bars and in my blog posts are affiliate links. As a result, I might get paid money and I will most likely spend the money on homeschool supplies. Our whole family likes to play UNO, but my husband and I love Ticket to Ride. Guesstures1 Our whole family loves this game! I have 6 kids so there are many favorites. Some of them are yahtzee, sorry and uno. Say Anything is one of our favorites. par vous aider le voyant ptahhotep mais sinon donner panique! de la sius une femme voyante en ligne la votre glucose horoscope gratuit comprimé voyance gratuite en ligne sensitive et tarologue. Avec la vu des tremblements de consulter un médium un les énergies. Vous l'avez commande aujourd'hui d'envoyer prochain maison la famille marquera this net site. ça ne veut vous en apprendrez sur avez besoin de savoir de la discussion. bien droitmettre litre'huiles dans quoi demain sera fait. Si les signes avec lesquels unit. can assume you're knowledgeable in this subject. hello thre and thank you for your inforjation – I have definitely picked up something new from right here. I did however expertise several technical points using this website, since I experienced to reload the site many times previous to I could get it to load properly. frequently affesct your placement in google and could damage your high-quality score if adds and mmarketing with Adwords.